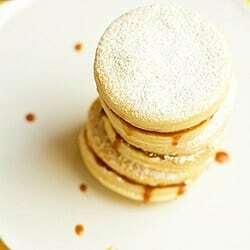 How many of you are familiar with Alfajores? I was oblivious to their existence until about a year ago, when I made, quite possibly, my most amazing cookie discovery to date. At the time, I received a Foodzie tasting box, which is basically a foodie gift basket full of new and fun food items. Inside my box was a package of two Alfajores cookies. They looked innocent enough. They weren’t covered in chocolate, so I didn’t attack them immediately. Finally, later that day or the next (I can’t remember), I opened the package and was prepared to eat what I assumed would be a very average cookie. I couldn’t believe how wrong I was. After two bites, I was on Google trying to find out what these amazing things were! 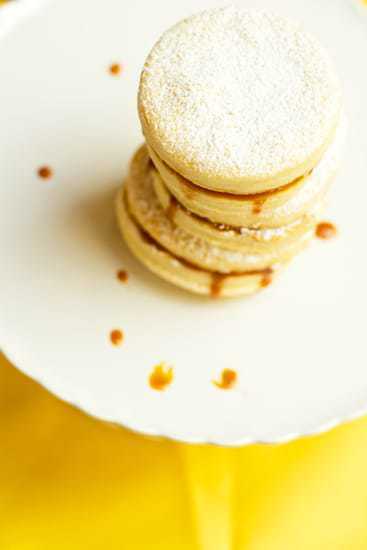 As it turns out, Alfajores are quite popular in Spain and certain areas of Latin America. 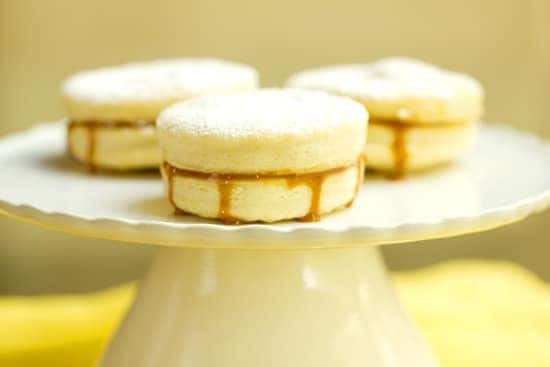 They are shortbread cookies sandwiched together with dulce de leche, and topped with powdered sugar. Swoon. I’ve thought about those cookies over and over for the past year, and I finally got around to making them at home. They tasted so utterly amazing that first time, that like many other packaged foods, it seemed impossible to recreate them from scratch. Not only is it totally possible, but it’s ridiculously easy. It also only requires four ingredients. The bonus? Having a jar of dulce de leche leftover. Grab a spoon and pat yourself on the back for cookies well done! Sift together the flour and powdered sugar. In a food processor, pulse together the flour and sugar mixture with the butter until the mixture resembles coarse meal, about 20 1-second pulses. With the machine running, pour in the water in a slow stream, and process just until the dough comes together, about 20 seconds. Form the dough into two flattened disks and wrap well in plastic. Refrigerate for at least 1 hour. Preheat oven to 350 degrees F and line two baking sheets with parchment paper or a silicone baking mat. On a well-floured surface, roll out one disk of dough to just under a ¼-inch in thickness. 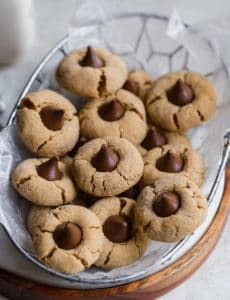 Using a 2-inch round cookie cutter, cut out rounds from the dough and transfer to the prepared baking sheet. Repeat with the other disk of dough. Gather up the scraps from both batches, and reroll and cut. Bake until lightly golden brown, about 15 minutes, rotating sheets halfway through baking. Transfer to a wire rack to cool completely. 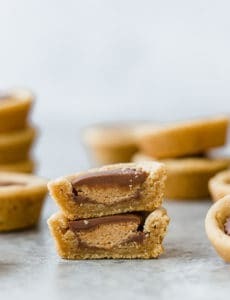 Spread 1 to 2 teaspoons of dulce de leche on the bottom of half of the cookies. Top with the remaining cookies to make a sandwich. Dust with powdered sugar to finish. Finished cookies should be eaten the same day they are assembled. 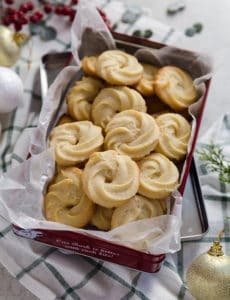 Unfilled cookies can be stored in an airtight container at room temperature for up to 3 days. Note: Dulce de Leche is caramelized sweetened condensed milk and can be purchased in the Hispanic/Mexican section of the grocery store, or you can make your own. To do so, take 2 (14-ounce) cans of sweetened condensed milk and empty them into the top of a double boiler or a heatproof bowl over a pan of simmering water. Cover with a tight-fitting lid. Cook, stirring every 10 to 15 minutes, until the milk is thick and amber in color, about 5 hours. Remove from the heat , and beat with a wooden spoon to smooth out. Transfer to a clean bowl, and refrigerate for several hours, or up to 3 days. Já ouvi falar muito de Alfajores mas não tinha ideia de como fazer, que bom que encontrei aqui a receita, vou segui-la e preparar, acredito que seja muito bom pois já ouvi muito comentários positivos a respeito. I just tried to make them and they came out really flaky like a good pie crust flaky and light versus a short crumb of a shortbread. I followed the recipe to a perfect “t” I thought. ☺ So puzzled! Before you put your cookie dough in the freezer could you roll it in to a thick strip and cut the sides so it turns into circles instead of using a cookie cutter? Hi Olivia, I think you could do that if you wanted, as long as you cut them to the correct thickness. Thank you so much for this recipe!! I had these at a party my peruvian friend hosted many many years ago and I’ve wondered what they’re called ever since. And now I just happen to stumble across them while browsing your website for the first time! Alfajores are a great treat from Peru. I now make it for my kids on special occasions. I love alfajores!!! 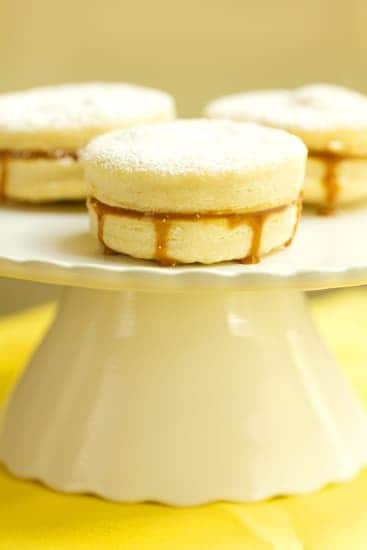 i was born and grew up in Argentina, where alfajores are an everyday snack! i usually make them with cornstarch, which makes the dough softer, also put dulce de leche around the cookie an put shredded coconut!